The DFC program has been a central, bipartisan component of our nation's demand reduction strategy since its passage in 1998 because it recognizes that the drug issue must be dealt with in every home town in America. Housed in the Office of National Drug Control Policy, it provides the funding necessary for communities to identify and respond to local drug and alcohol use problems. provide a dollar-for-dollar match for every federal dollar (up to $125,000/year). Despite the growth of the program, from $10 million in 1998 to $95 million in 2016, since its inception there has only been enough money to fund 32.7% of those who have applied for funds. DFC grantees have reduced drug use and abuse in communities throughout the country to levels lower than national averages because they are organized, data driven and take a comprehensive, multi-sector approach to solving and addressing drug issues. DFC coalitions are singularly situated to deal with emerging drug trends, such as methamphetamine, prescription drug abuse and synthetic drugs because they have the necessary infrastructure in place to effectively address drug related issues within their communities. 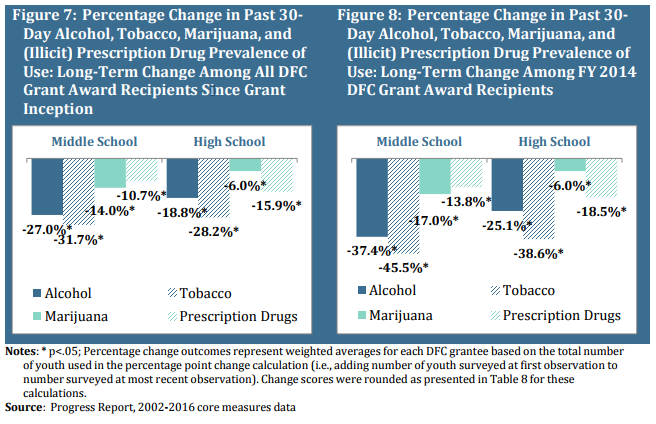 The DFC grant program takes a comprehensive, multi-sector and data driven approach to prevent and reduce youth substance use/abuse in communities throughout the United States. The White House Office of National Drug Control Policy (ONDCP) recently released the findings for its National Evaluation of the DFC Program. Prevalence of past 30-day use declined significantly across all substances (alcohol, tobacco, marijuana) and school levels (middle and high school) between DFC coalitions’ first and most recent data reports.